NASCAR in 3D comin’ at ‘cha! 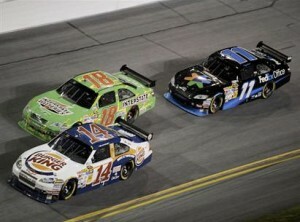 Turner Sports will be bringing NASCAR to your home theater in 3D, starting on July 3, 2010 with the Coke Zero 400 race. This will be NASCAR’s first 3D production and will be available to DirecTV customers (the only TV service mentioned so far) as well as online at NASCAR.COM through their RaceBuddy3D service. The production will be presented in high-def widescreen letterbox format and will feature two custom 3D feeds. One feed will mix different camera angles from around the track while the second will be focused on pit crew action. The RaceBuddy3D service is an online broadcast of special camera angles from the Coke Zero 400 race that requires you have a 3D computer, NVIDIA 3D glasses, IE7 or newer browser, Silverlight plugin-in, and at least 3.5mbps of bandwidth. Check out the full requirements on NASCAR’s webpage. NASCAR will join other sports which have taken the 3D plunge such as NHL, MLB, the Masters, and the most extensive 3D presentation so far being FIFA and Sony’s coverage of the World Cup 2010 from South Africa. “Our fans have been asking us about 3D for several months so we’re excited to deliver that to them for the first time ever in what will likely change how NASCAR is consumed moving forward,” said Jay Abraham, chief operating officer of NASCAR Media Group. The Coke Zero 400 powered by Coca-Cola event starts at 7:30 p.m. Eastern Time on TNT, with a “Countdown to Green” pre-race show starting at 6:30 p.m. Eastern Time. UPDATE: Comcast, Time Warner and Bright House to also broadcast NASCAR in 3D. Check out more 3D news from our dedicated 3D news category. best buy will probably have it going during the race so you can check it out. the store near me has directv. its gonna happen eventually – just too expensive right now. I would love to see the difference with 3D for a sport like NASCAR. If 3D works for NASCAR, I think we will be seeing more of it in a lot of sports.